As you might have heard, ApiOmat provides an array of useful modules with packaged functionality which are ready to use. This tutorial will show how simple it is to use this type of module in your app. In this example, we choose Andoid as language. First you have to login and wait until the dashboard has loaded. 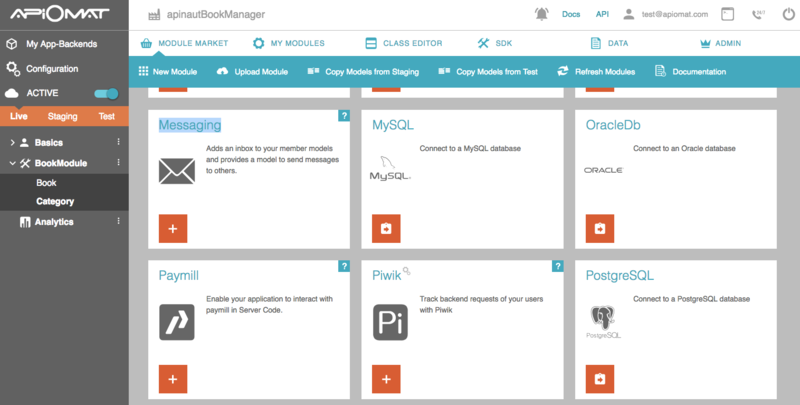 Create a new app and add the "Messaging" module from the Module Market. Deploy the app after the module has been added. Now your app is up and running. Download the SDK for Android in the SDK screen. First, unzip the downloaded SDK to your src folder. com.apiomat.frontend.basics.MemberModel should be now accessible as Java class. Further documentation on the Messaging module can be found in our wiki. Attention: If you use the code without unzipping your own SDK into it, you will have to change the base URL and apiKey in the MemberModel class to your own values. These can be found in the SDK or in the deploy screen.